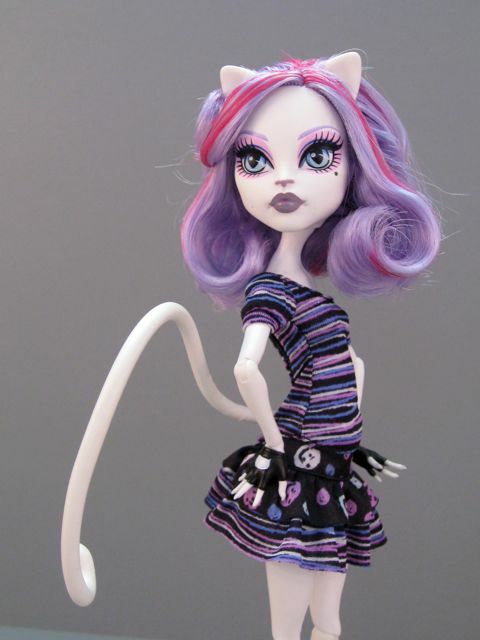 Scaris "Catrine DeMew" Monster High doll. 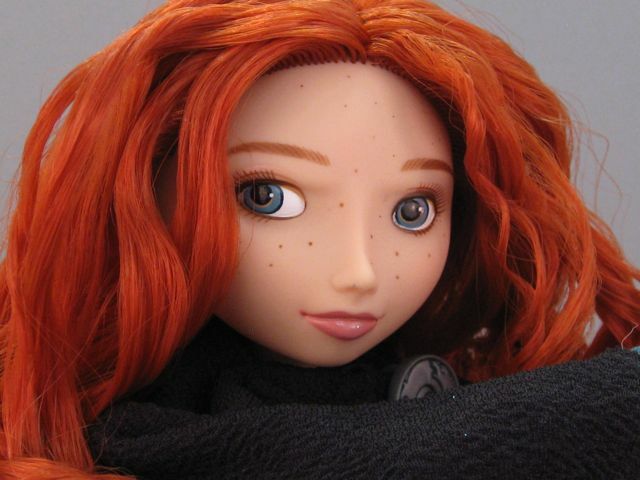 I have already reviewed the original 12" Merida doll from the Disney store (love her) and took an in-box look at the first 17" collector's edition Merida doll, but I couldn't resist ordering a third Merida--the 17" talking play doll version ($29.50). 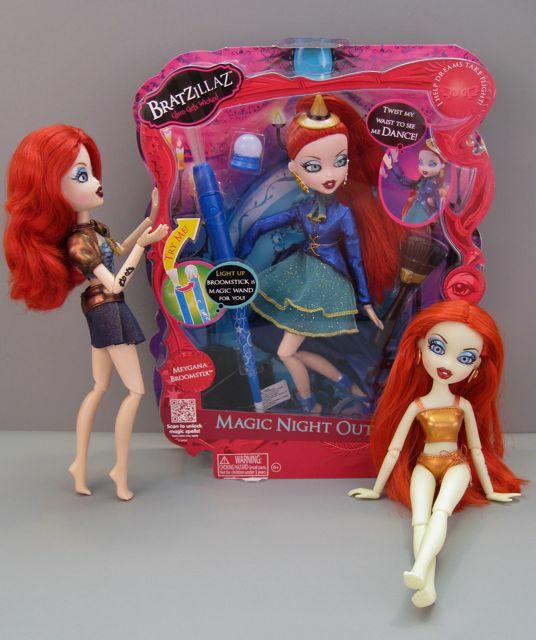 Having never owned a singing Disney doll before, I wondered if these princesses might offer a nice middle ground between the small inexpensive play dolls and the larger limited editions. Merida talking doll from the Disney Store. I have wanted to write this review for a long time. It is probably too ambitious, but I'm going to give it my best shot anyway. Last year, during the Jason Wu Integrity Toys pre-ordering frenzy (which I have no skill at whatsoever) I had a vision of doing a comparative review between Integrity dolls across different price points. In particular, I have always been curious about the differences between a Fashion Royalty doll and a Dynamite Girl. I wanted the dolls I compared to look similar and I wanted to like all of them enough that I would buy them even without this crazy review scheme. The problem is, the Integrity pre-order situation is hard enough without throwing in so many other constraints. Still, I did pretty well. I ordered "Back to Brooklyn" Gavin, a Dynamite Girl ($65.00), and Fashion Royalty "World on a String" Eugenia Perrin ($110.00). I also ordered the discontinued ITBE doll, Confident ($19.99). They are all redheads. The dolls arrived at various times over the past year. Eugenia trailed the pack and didn't make her appearance until the end of December. Having just gone through the Integrity pre-order for 2013, I thought that this would be a good time to de-box my 2012 girls and see what Integrity has to offer at three very different prices. Left to right: Dynamite Girl ($65), Fashion Royalty ($110), ITBE ($20). I am up to my ears writing my next (really long--sorry) review, but I had to share this piece of news with all of you instantly. You know I love Liv dolls, and maybe you remember that I have this strange desire to own all of the Liv Sophie dolls. This obsession started when Spin Master released their second wave of Liv dolls, and I didn't think I should buy all of the characters again so soon. I mean, the dolls look pretty similar from one wave to the next and they aren't free. So, I decided to buy just Sophie from every wave, and then maybe other dolls now and again if there was one that really appealed to me. That sounds almost reasonable, right? Except that for some reason I decided that all of my Sophies should stay in their boxes. This is edging towards the loony side of things, I realize, but once I embark on something, I find it difficult to stop. So, I bought a Sophie from every wave and am keeping my Sophie army carefully stored in their boxes. Spin Master has made a lot of Sophie dolls. Seventeen, to be precise (including the huge Sophie styling head). I'll admit to feeling a little tiny bit relieved when the Liv line was discontinued, simply because there's not much room left in my house for more Sophies. "Girls Getaway" Sophie with Sophie as Alice. and Midnight Beach Meygana (right).